Noah’s GMO ark: is it ethical to create GM or cloned animals for sale as pets? Even as much of the discussion surrounding powerful new gene editing and cloning technologies has centered on their possible use in humans, the creation of genetically modified (GM) and cloned animals has advanced at warp speed. Some of these efforts have been for research, which is justified. But many seem profit-centered and the GMOs are intended to be products for sale as pets. Is this Noah’s ark of GM and cloned animals for pets a good idea? The new generation of animals includes GM dogs and pigs with big muscles, pigs that may lack immunogens if used to make organs for transplants into people, GM super tiny micropigs, Hwang’s cloned pet dogs, and a host of other animals that I have called CRISPR-y critters. There are also the GM GloFish, the first GM pets. Admittedly, in some cases the GMOs are definitely cute and interesting. The idea of a GMO pet is not entirely out of the question for me in the future, but the more I learn about it the more I have realized there is a complicated back story here. As we ponder these and other GM animals in the works, what goes into the dialogue over bioethics here, particularly when we are talking specifically about the animals being pets? There’s more to it than is apparent on the surface. For instance, the creation of cloned dogs and almost certainly GM dogs takes the lives of other dogs in the form of surrogate mothers and egg donors. The same is likely true of other GM and cloned animals. We don’t know the exact answer to this equation if we try to solve for X today, but it would probably be unsettling: 1 cloned or GM pet animal = X dead animals. It wouldn’t surprise me if to make one GM or cloned pet dog the process leads to the death of 3-6 dogs overall. It could be much higher. The same is true for GM pigs intended to be pets. Surrogacy and egg harvesting involve the potential for pain and suffering as well for the animals. Then of course there are the unknown number of failed attempts at making GM and cloned pet animals. Some of these failed “attempts” probably die postnatally. Is this justified in the context of creates pets to be sold? Again, all of these considerations or concerns potentially can be balanced in the very different context of a research setting by gains in biomedical knowledge and human health. Even then bioethical considerations should be and usually are part of the process. 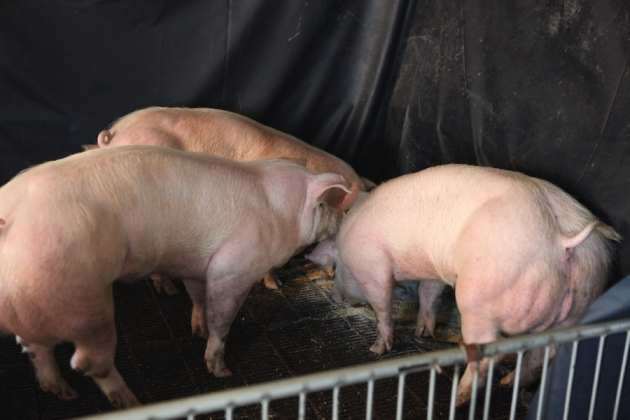 In agriculture, super-muscled pigs or other GM animals such as potentially cows without horns (so that they do not have to go through the difficult process of being de-horned), may also have good rationales. But what if the cloning and genetic modification of animals are instead mainly for fun/profit through selling the resulting animals as pets or novelties? Also, does this all make the public more comfortable with the idea of potential future GM humans? Overall, I believe there needs to be increased transparency in the area of GMOs as pets, increased knowledge of the more unsettling side to the production process, and more discussion of the key issues. Monkeying around with myostatin: on the road to healthier humans or human hulks? Poll: heritable CRISPR tried in humans in next 10 years? Genetically Modified Humans Now Inevitable? We should stop asking such questions. Some ethicists will always answer yes, other ethicists will always answer no. Do you want to be beholden to professional moralizers, who virtually always know less about your science and its aims than you do yourself? Steven Pinker aside, the ethicists I know are all roughly as intelligent as pond scum. Their sole instinct is risk aversion — which does not always benefit society, and is starkly ignoble and cowardly to boot. In any cased, when faced with questions such as the one you’ve posed, I think that the right answer is always: Do whatever you are inclined to do. As long as it is compliant with the letter of the law, you’ll be fine. If the experiments you would like to perform are not legal where you reside, you are still free to move to a different jurisdiction. (Aside: That the law always lags behind the cutting edge of scientific progress is a damn good thing.) If you want to clone pets for sale… why not? Surely it won’t hurt anybody, so what’s the issue? Hell, put together a decent proposal and you’ll receive more VC interest than you’ll know what to do with. As for “does this all make the public more comfortable with the idea of potential future GM humans?” — Package GM-humans as humans cured of terrible diseases, and the public will be comfortable with it immediately. I’d even go a step further: There’s nothing we can do to stop a posthuman future. Public acceptance doesn’t mean a damn thing where this is concerned… as such things are not really meant for the public at large, anyway. Science is all about asking questions. We should never stop. In a deliberative democracy, which by the way needs real science, we should challenge other’s ideas. If you feel that bioethics is more “professional moralism” than anything else, by all means say so. And you can of course even say “stop asking questions”, but at the same time I can say I disagree. As to risk, I say balance risk with potential rewards as best as you can based on facts/data. I agree that if GM humans are marketed as “humans cured of diseases” then the public will view that differently. But once we go down that road I suspect we’ll be unable to stop some from using the same tech to try to make super-muscled people, glowing people, Ken-Barbie people, Kardashian look-a-likes, etc. etc. The lines between pet animals and animals for food or research/medicine is not distinct. My dearly-loved dog is viewed by others as their doggy stew — so to speak. Is domestication ethical? Perhaps when it is mutual (man-woman or man-dog) but maybe not when it is exploitative (chicken farming)? I suggest that humanity violated laws of evolution and ecology as they pertain to all other animals when we started down the path of agriculture and industrialization. My point is this: the main virtue for an examination of the ethics is to make sure that we really are conscious of what we are doing. So great question Paul, but I can’t give really answer it. I don’t disagree with what you say. Indeed I applaud you! Please excuse my slight diversion on one tiny, tiny little point. A “pet” is a beautiful metaphor for everything that we hold dear, for all that we love, for all who we love, and for all who love us. This is a question, and a forum, that is about all of us and for everyone! As always you make too much sense at times. I do think there’s a valuable role for bioethics though even though I am not in that field myself. It is hilarious Brian that you mentioned “edit sober” and “to hell with editing” because in the vernacular of us genetics scientists we use a process that we call “gene editing” to make the GMOs including the pets. I would add that raising questions and soliciting feedback from a diverse audience promotes science and best practices. SciComm via social media is a dynamic and powerful form of inbound marketing where science presents and engages. Opinions should be varied and add perspective, along with the full and accurate dissemination of information. What concerns me is not if there will be restrictions on scientific freedoms but the extent to which our free will is being expressed experimentally and commercially in areas that were envisioned to address medical needs. Animal breeding has a long history – so to an extent the GM factor has already been felt. Specifically creating non-human super species or developing specific cross traits should be for a good reason if you ask me. Just for the sake of it seems somewhat cavalier even if we have the power to do so. Wielding power just because you have it doesn’t prove anything, except that you have the power. Governance is required within society to balance things as per a consensus – even it means cultural divergence in the world when other nations have a different view. Attempting to unify the concepts should be a priority – genetics and what is ethically sound is part of that ongoing process. Who has the vote on what is sound? it’s purely ethical, we kill those animals to eat them, now you talk abou cloning them being “ethical” or not? Of course it’s ethical, specially if one animal produces more meat so we kill less animals to enjoy a slab of steak or pork chops.